For my final film, I watched Kuch Kuch Hota Hai, a 1998 film that was written and directed by Karan Johar. This movie stars Kajol and Shah Rukh Khan, the same pair that starred in the 1995 Dilwale Dulhania Le Jayenge. Kuch Kuch Hota Hai has many similarities to DDLJ, and many of the other films we have seen in this class, but also sets precedence for many new customs in Bollywood. Kuch Kuch Hota Hai opens on Rahul, played by Shah Rukh Khan, standing in front of his recently deceased wife’s funeral pyre. The wife, Tina, dies soon after childbirth due to complications and leaves Rahul with a daughter that Tina insists is named Anjali, after Rahul’s best friend in college. Before her death, Tina writes her daughter eight letters that she receives one on each of her first eight birthdays. The letters are supposed to tell her everything she wishes to know about her mother. In Tina’s absence, Rahul serves as both a mother and a father to Anjali, with the help of Anjali’s live-in grandmother. In the eighth letter that Anjali receives, her mother describes her dying wish to her daughter: to have Rahul reunited with his best friend in college, Anjali. The two had a very close friendship, and ‘ruled’ the college together. As the audience sees through a series of flashbacks, Anjali, played by Kajol, is a tomboy who frequently beats Rahul at basketball and is nothing like the ‘stupid’ girls that he usually chases. 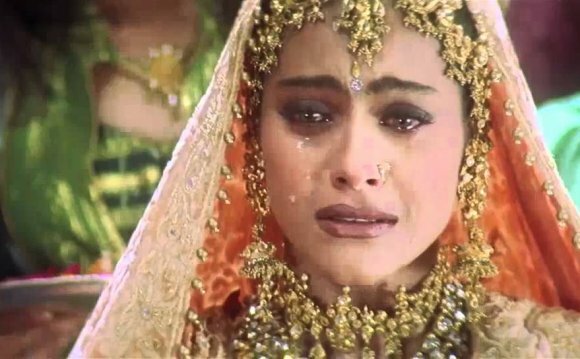 When Kajol realizes she is in love with Rahul, she tries to make herself look beautiful like the new girl, Tina, who Rahul is interested in. Unfortunately, her efforts are only met with mockery from her classmates, and Rahul does not see her as anything more than a friend. Faced with the misery of knowing that Rahul loves Tina and not her, Anjali leaves college and does not make any effort to keep in touch with Rahul. Tina knows of the love that Anjali has for Rahul, and even thinks that it could be greater than the love she herself holds for Rahul. Thus, she feels bad for coming in between them. To fulfill her mother’s wish, child- Anjali goes to the summer camp that Anjali works at and pretends to be sick so that her father will come to her aid and run into his old college friend. Anjali is engaged, though, and their reunion is complicated with the arrival of her fiancé. Kuch Kuch Hota Hai makes many cinephilic references to its predecessor, DDLJ. Besides having the same actors play the ‘right’ couple, Rahul’s mother is played by the same actress who portrays Simran’s mother in DDLJ, Farida Jalal. In addition, Raj’s last name in DDLJ, Malhotra, is used as the principal’s name in Kuch Kuch Hota Hai. We also see Tina singing the same Hindi prayer song as Simran sings for in front of her father, which sets both girls up as innocent and pure. Kuch Kuch Hota Hai, though, takes a few more steps towards modern ideas than does DDLJ. For example, Western clothes and practices are less condemned in Kuch Kuch Hota Hai than in DDLJ. The grandmother does get angry at the camp director for raising a flag of England instead of one of India, but is not nearly as intense in her dislike of the West as is Baldev Singh in DDLJ. In addition, though Kuch Kuch Hota Hai shows the same type of wealthy, colorful and elaborate wedding party as does DDLJ, both the bridegroom and Rahul both are wearing Western suits instead of more traditional garb. Sana Saeed (born 22 September 1988) is an actress and a model.